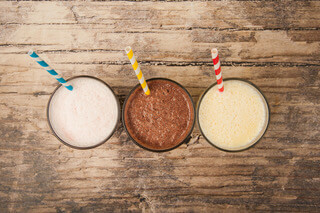 Milk drinks have become a popular product in the minds of both adults and children. Offering a wide range of chocolate or fruit flavours and seasonal variants, these drinks are often preferred to fizzy drinks by parents when looking for on-the-go or pack lunch options. Many confectionary brands have also developed or licensed products that echo well-known chocolate bars through brand extension. Advertising in this area typically references these products as a good source of Calcium and other nutrients for children. Often Sweet and colourful their appeal to children is obvious. At the other end of the scale, fortified whey drinks offer a clean and refreshing healthier option to adults. Today, milk drinks include a number of variations and include flavoured, milkshakes, acidified fruit milk drinks and for those who are lactose intolerant, dairy alternative milk drinks. Click on the items in the cabinet opposite to view the milk drink solutions that we can offer.